Phoenix is a city that has long struggled with neighborhood identity. Take its large number of transplants, combine them with a grid of arterial streets, and the result is a population likely to describe places in terms of intersections rather than neighborhoods. It’s a minor miracle, therefore, when a business takes its name from the little known neighborhood in which it lies. In the case of St. Francis, located just two blocks east of the Central / Camelback light station, the name reflects a very specific neighborhood, rather than the broader, more ambiguous “Uptown” that surrounds it. St. Francis the neighborhood is the residential area that lies southeast of Central and Camelback, just above the landmark Brophy and Xavier schools. The St. Francis neighborhood is not as well-known as the nearby Windsor Square, Medlock Place, and Pierson Place historic districts, but its namesake restaurant helps put the area on the map. The new restaurant is an adaptive reuse of a mid-century building with some changes to the building’s character as a result of the transformation from offices to dining. A small counter faces the open kitchen, and another faces the bar. Development along Camelback Road was designed primarily for the car, but St. Francis addresses the sidewalk more than the parking lot. In a pleasingly unusual move, those arriving by car must walk around to the front to enter the dining room. Usually, it’s the other way around with those arriving on foot having to awkwardly navigate a parking lot in order to reach the front door. 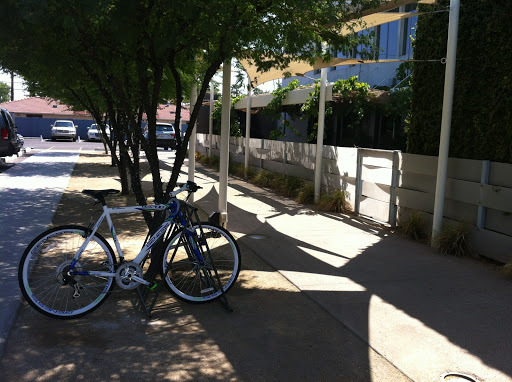 Likewise, bike racks are situated prominently near the restaurant entrance instead of being hidden in the back. A patio wraps around the building on two sides, reinforcing the open, airy feel of the interior. St. Francis doesn’t offer its own version of the ubiquitous field greens salad; instead, the restaurant produces a hearty take on a Caesar with romaine hearts, corn, and green beans in a buttermilk dressing. 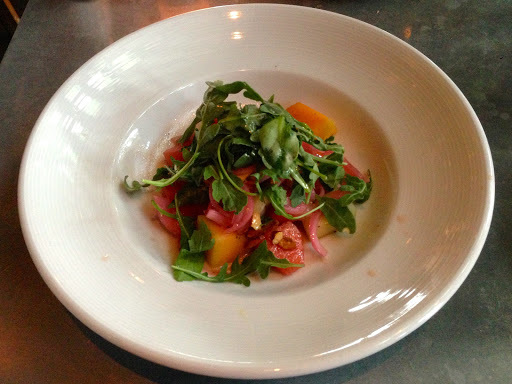 Fresh produce of the season shows up in contexts such as a melon salad, with slivers of sweet, summery fruit placed in contrast with peppery arugula. A spinach salad blends greenery with eggs and pickled eggs, allowing a few sharp notes of flavor to punctuate the mild leaves. 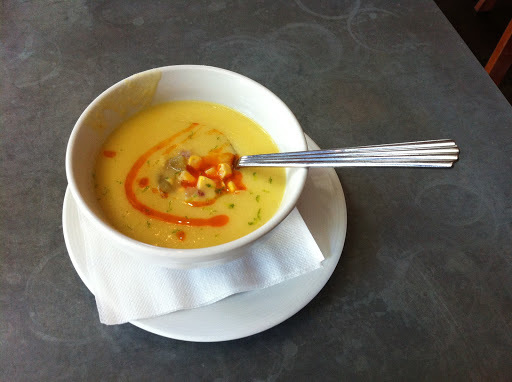 A sweet corn soup is rich and velvety, almost a meal in itself if consumed in large amounts. A wood-burning oven is central to the cuisine at St. Francis. 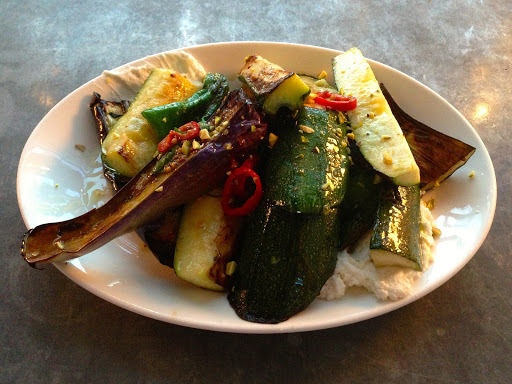 There’s a lot of emphasis on roasted foods as seen in simple starters such as “summer squash,” big chunks of zucchini and eggplant topped with a little goat cheese and a sprinkling of pistachios. The roast fingerling potatoes side dish functions just as well as a first course. These tubers appear almost like tempura, but embellished with fresh rosemary and sage leaves.The oven is also used to produce flatbreads, some of them pizza-like with cheese and tomato, others with toppings such as smoked salmon, dill, and capers. 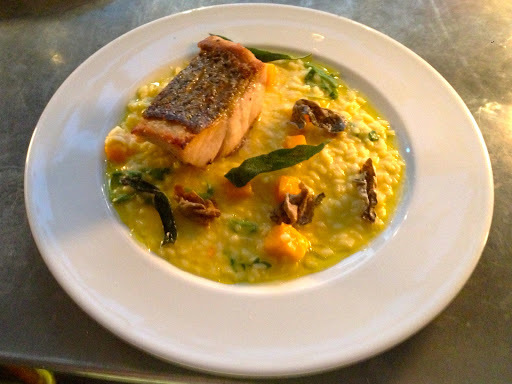 The best use of the wood-burning oven, however, is often what’s listed on the chalkboard near the door as a daily special. 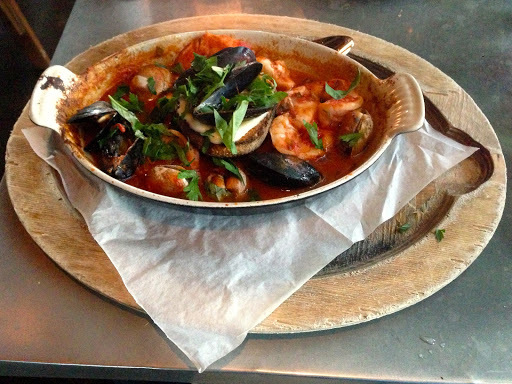 At many times, this means seafood, whether a sliver of striped sea bass over butternut squash risotto with fresh sage or a bowl full of cioppino overflowing with shrimp, fish, clams, and mussels in a lively tomato-flavored broth. A constant offering is the salmon superfoods entree, which places a piece of the popular fish over quinoa and avocado. Its light reputation is reinforced by the enormous plate it is placed on, making the serving appear smaller than it really is. Other menu perennials include a simple but well-prepared roast chicken entree and a hearty bowl full of three giant meatballs flavored with a Moroccan spice mix and presented with firm pearls of Israeli couscous. Pork chile verde with cornbread is among the richer choices, while the forbidden rice bowl is a lighter touch with its mix of dark grains and a variety of roasted vegetables. The same contrast appears in the sandwiches, which range from the indulgent “Pig Dip,” based on pork loin, bacon, and prosciutto all in the same bun, to the lighter chicken salad sandwich flavored with zatar. 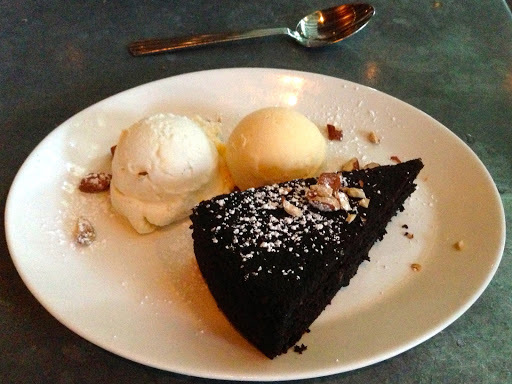 A fresh, seasonal approach is evident not only in the food, but also in the beverages. The same chalkboard that spells out the special entree also notes a featured cocktail such as a ginger peach lemonade, given both its alcohol kick and its fruit flavor from peach vodka. 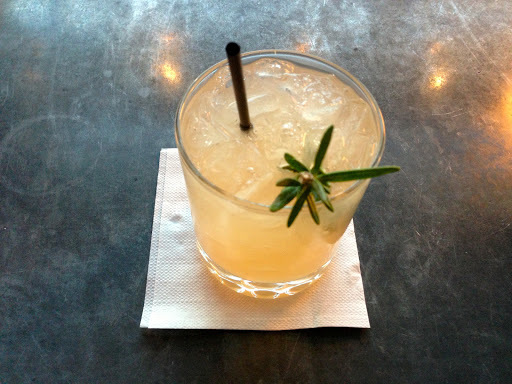 Ginger and a sprig of rosemary enliven the drink with contrasting tangy and herbal notes. The wine selection is global — a little Arizona, some Europe and South America, and a lot of Australia and West Coast. 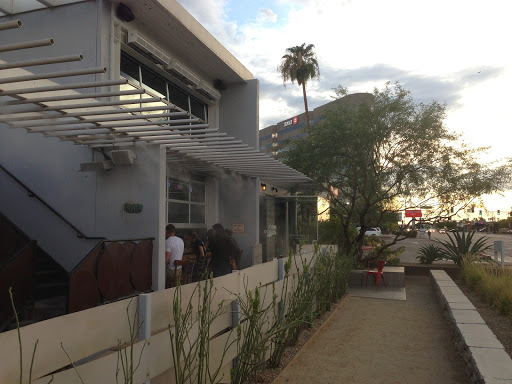 Draft beers include local brews from Four Peaks and Sleepy Dog, as well as rotating selections from elsewhere. Sweets are featured in a small dessert menu. Cheesecake in a jar is just what it sound like: multiple layers that resemble a piece of sand art. It starts with a creamy cheese layer on the bottom, adds a bit of crunch in the middle with graham cracker crumbs, and becomes creamy again on the top from whipped cream. Sticky toffee pudding is smooth and indulgent, chocolate stout cake is straightforward, and the gelato and sorbet combination, two modest scoops, is the lightest of the bunch. Expect more sweets offerings such as a fresh-baked cinnamon bun on the brunch menu. Despite a James Beard award nomination and clientele from all over, St. Francis calls itself a “neighborhood restaurant,” a phrase that seems more authentic here than at the Applebee’s just down the street. Children are welcomed with free meals from a kids menu, there’s live music on Sundays, and the staff exude a friendly vibe. It’s not uncommon to overhear customers from elsewhere in the metropolitan area asking about the restaurant’s name. If the answer helps cultivate a bit of neighborhood identity in this part of Phoenix, that’s a nice side dish with any meal. Huge St. Francis fan right here. I'm not thrilled by their happy hour food (burgers, sandwiches, etc) but the finer meals are to die for. I've had the green chile and the roasted chicken and both go down as some of my Favorite Meals Ever.